Is John Piper an Antinomian?, a small 50 page book published by Belmont House Publishing, deals with Piper’s antinomianism. 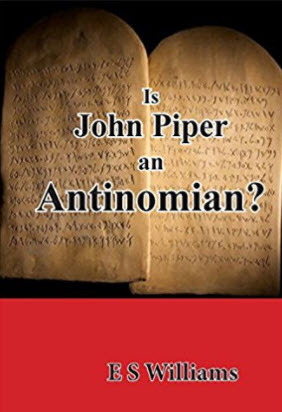 The book explains the meaning of the term ‘antinomianism’, discusses the moral law of God, and provides clear evidence from his own words that John Piper is indeed a committed antinomian. Pastor John Piper, author Desiring God; Meditations of a Christian Hedonist (1986), has been invited to be the keynote speaker at the London Men’s Convention planned for June 2018. Rev. Richard Coekin, Director of the Co-Mission group of churches in south London, has recently announced his invitation to John Piper. Coekin demonstrated his lack of spiritual discernment when he invited Mark Driscoll to speak at the London Men’s Convention in 2011. In our review of Professor David Murray’s book, The Happy Christian, we show that Murray’s concept of happiness comes from the ideas of Positive Psychology. This book will be available for purchase in early September. Many people sense that there is something profoundly wrong with combining the Christian Faith with the philosophy of hedonism, but few people are able to explain why Christian Hedonism is a false doctrine. This short book sets out to evaluate John Piper’s teaching in the light of Scripture. We see how he amends the Westminster Shorter Catechism to say that ‘the chief end of man is to glorify God by enjoying Him forever’. We see how he creates a new commandment, ‘Delight yourself in the Lord’, from Psalm 37.4, and then tells Christians that the vocation of their lives is to seek maximum pleasure in God. We observe how he extols the worldly worship of a Passion Conference. We learn of his new definition of love as ‘holy, divine Eros’. We note how he cleverly ‘digs up’ Scripture to find a ‘happy God’. We see how Scripture is twisted to make the claim that the apostle Paul and the Lord Jesus Himself were Christian hedonists. This book provides clear evidence that antinomianism is the underlying error upon which Christian Hedonism is built. 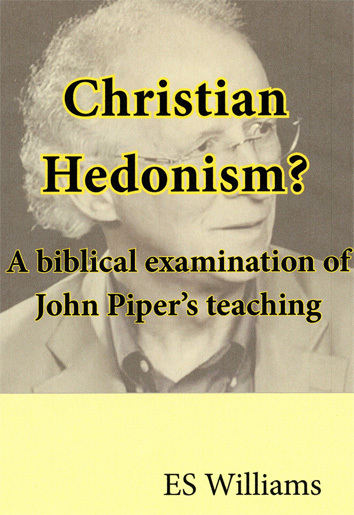 A book on John Piper’s Christian Hedonism, written by Dr ES Williams, is due to be published in August 2017. Many people sense that there is something profoundly wrong with combining the Christian Faith with the philosophy of hedonism, but few people are able to explain why Christian Hedonism is a false doctrine. This short book sets out to evaluate John Piper’s teaching in the light of Scripture. We see how he amends the Westminster Shorter Catechism to say that ‘the chief end of man is to glorify God by enjoying Him forever’. We see how Piper creates a new commandment, ‘Delight yourself in the Lord’, from Psalm 37.4, and then tells Christians that the vocation of their life is to seek their maximum pleasure in God. We hear how Piper extols the worldly worship of a Passion conference. We learn of Piper’s new definition of love as ‘divine, holy Eros’. We see how Scripture is twisted to make the claim that the apostle Paul and even the Lord Jesus Himself were Christian hedonists. This book provides clear evidence that antinomianism is the underlying error upon which Christian Hedonism is built. Dr Williams was the Director of Public Health for Croydon Health Authority for many years. He is the Author of many books, including The New Calvinist; Ecumenism: Another Gospel and Holistic Mission: Weighed in the Balances.